IT'S A NEW MUSCLE POST, EVERYONE! Sorry, I got distracted by other projects and life in general. One note before I get into my most recent work: I am now collecting other blogs/sites that deal with nylon muscles in the right-hand sidebar. If you run or know of a site that isn't listed, please tip me off so I can include it. There were several things I got very tired of while experimenting on these muscles, and one of them was trying to measure deflections on the order of millimeters by squinting at a ruler mounted beside the muscle. Dangling everything from the edge of the dining table or ottoman was a bit awkward too. So I built myself a muscle test rig out of scrap wood. It provides a place to suspend an actuator and a weight and converts the linear motion of the actuator into the angular motion of a long needle. Small movements at one end of the needle are amplified at the other end, making them easier to see and measure. The first version of the test rig just had a needle which pivoted on a piece of stiff wire driven through the board behind it. 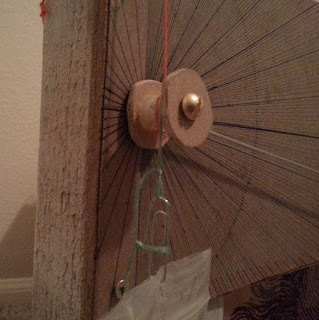 The pivot point was located very close to one end of the needle, and on the short end there were too loops of wire attached to the needle: one to connect the muscle, and the other to connect the weight. This arrangement left some things to be desired. For one thing, I could never get the wire perfectly straight, or constrain the needle so that it would lie flush with the graduated backdrop. 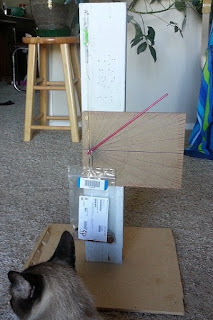 That meant the needle's rotation was not planar, or it would stick as it turned, etc. On top of that, the motion of the short end of the needle didn't leave the muscle free to move straight up and down. Near the needle's zero point, the motion of the muscle is approximately vertical … but as the needle continues to rotate, its end begins moving more and more in a horizontal direction, changing the mechanical advantage the muscle has and introducing complications that I would rather not deal with. Left: Muscle suspending weight on deflection test rig, version 1. Right: close-up of the reel on version 2. For testing muscles that only contract over a short distance, this thing is amazing. No more staring at the muscle and thinking, Huh, is it doing something? I'm not quite sure. When the muscle starts moving, I get an obvious deflection out of the needle. The biggest remaining issue is that there's enough friction and/or elasticity in the system that there isn't a well-defined zero point for the needle. For a given muscle-and-weight setup hanging passively (muscle is turned off), there's a fairly wide angular range within which I can position the needle and have it remain stable. When I take a muscle through a heat-cool cycle, the needle generally doesn't return to its original position at the end of the cool cycle. How much of this is due to the muscle stretching out and how much is just the equipment, I unfortunately can't say. The other little quality-of-life improvement I attempted for this round of muscle experiments has to do with ease of manufacturing. I was sick of going through the effort of making a muscle, only to have the fragile heating wire snap at the last minute. When that happens, the nylon can't be returned to its pristine state, and now the wire is too short – so often I would be forced to throw everything away and start over. Putting extra slack in the wire could result in bunching and loose wire coils, promoting uneven and inefficient heating of the muscle. So I tried a couple of different methods to relieve strain on the wire and keep it unified with the nylon. Coiling a muscle with tape tags. For Method 1, I tried attaching the wire to the nylon at intervals of a couple inches, using little tags of adhesive tape. These can be removed after annealing by sliding a straight pin in next to the nylon and pulling outward to separate the two sides of the tape tag. Method 2 was a little more wild: I tacked the wire to the nylon by coating both with a thin layer of silicone caulk. Messy as it sounds, I found that the best way to apply this was to stroke it on with my fingers. It cleans up just fine with some mineral spirits (paint thinner). In the end, I'm not sure if either trick helped a lot. 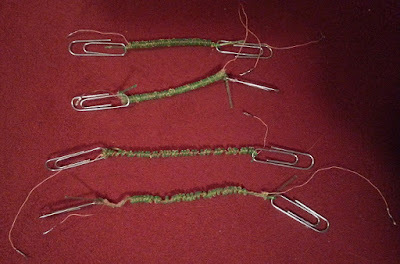 For each method, I made four muscles and lost one out of the four (due to snapped wire). That's not horrible, but certainly not great either. I did seem to get nice even coiling of the wire around the nylon. Besides trying out these manufacturing tricks, the principal experiment for this month involved rod-coiled muscles with spread coils. I had previously noted that the muscles with a smaller coil diameter could lift more weight, but had difficulty achieving a good contraction distance because their coils were already so tightly packed. I thought that coiling them around the rod with some spacing between the coils might improve that situation. Actually doing this turned out to be harder than I expected. Homochiral muscles naturally form close-packed secondary windings. You have to fight the muscle to get it to lie on the rod any other way – and the small-diameter ones fight pretty hard. What you see in the photo is the best I could do. 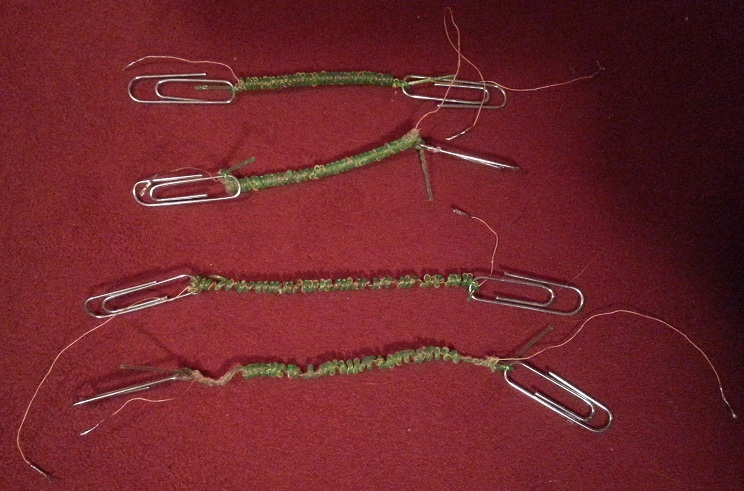 The mandrel diameter used for all of these is ~1 mm (large size paperclip wire). One of each type has a silicone coating, and one doesn't. The close-packed “controls” are on the top, and the ones with spread coils are on the bottom. Yeeccch. Those look terrible. But I decided to see if they would work anyway. I used a current of ~220 mA and ran a bunch of tests with different weights. All the muscles were allowed to heat for at least 4 minutes and cool for at least 9 minutes, with the idea that this would be sufficient time for them to reach “steady state.” Results are given in terms of the needle displacement in degrees, and represent the maximum distance the needle moved from whatever its initial position was. An entry of “failure” in the table means that the muscle started to stretch under the load when heated, i.e. the needle displacement was negative. None of these muscles went flat or limp and became permanently unusable. For all the muscles, the lightest-weight test was the last one performed. Thanks to the new test rig, I think these are more reliable than results I've posted previously – but you should still take them with a grain of salt, because running the tests spanned a hot summer afternoon, and I can't hold ambient temperature in the house constant. I wish I could repeat all of these many times and take an average, but I really don't have the time right now. So I'm putting up what results I have. With that disclaimer out of the way – the plain old close-packed muscle without silicone is the best performer by a good margin. I wanted to see if the silicone coating would have any detrimental effects on the properties of the muscle, and it appears that it did … so even if it does help cut down on manufacturing failures, it's probably not a good choice. My awkward attempt to spread the coils on the annealing rod doesn't appear to have panned out well either. But that doesn't mean spread-coil muscles are entirely out of the question. Perhaps one could wrap the muscle around the rod with close-packed coils – as it is naturally inclined to configure itself – and anneal it that way, achieving nice, even coils. Then the muscle could be removed from the rod, put under load and stretched a fixed distance, and annealed again by running an especially high current through the heating element. I suspect this would achieve much nicer results. Lots of failure in this post, in that none of my little “improvements” really worked out for the better – but maybe someone else can avoid the same dead ends.